A copper eagle statue from the Bank of Boston building in Buenos Aires from Eduardo Cohen. U.S. Antique Shows recently concluded the 55th year of the world’s largest indoor antique show, The Original Miami Beach Antique Show, with a three percent increase in attendance for all days of the event. The five day show was held at the Miami Beach Convention Center, Jan. 28 – Feb.1. The Miami Beach show presents nearly 1,000 recognized dealers from 30 countries and 35 states. Several prominent exhibitors traveled from as far away as Thailand, Uruguay, Hong Kong and Dubai at this year’s show. Attendees were able to explore profound historical collections from the Renaissance to Art Deco eras including fine art, American and European silver, antique jewelry, 17th-19th century furniture, porcelain and more. Additionally, the convention center’s Flamingo Ballroom presented an exquisite array of antique, estate and vintage pieces from highly regarded jewelry dealers. U.S. 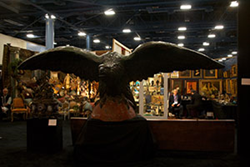 Antique Shows reported that 80 percent of exhibiting dealers renewed their booths for the 2017 show, which will be held at the Miami-Dade County Fair Expo Center, Feb. 10-13. Many stellar pieces on the show floor attracted the eye of both attendees and dealers alike. This included a spectacular copper eagle statue from the Bank of Boston building in Buenos Aires, valued at $450,000, from Eduardo Cohen as well as a sailboat illustration drawn by the first President of the United States George Washington at 10 years old from Tom Lingenfelter of One of a Kind Collectibles. Among the jewelry dealers, Gallery 118 showcased a necklace and earring set adorn with 73 carats of alexandrite and 21 carats of diamonds in an 18k gold setting. The show’s special events were also phenomenal successes. Appraisal Day, which is sponsored by Skinner Auctioneers & Appraisers, was the highest attended in its seven year history. In addition, the Third Annual Jewelry History Series reported a record number of attendees and established industry experts from across the country. The show has repeatedly demonstrated to be the benchmark event in the antique and antique jewelry industry. It has long been recognized by the Miami media and industry trades for its extensive selection of merchandise, cross section of buyers and sellers and consistent show traffic. In 2017, the Original Miami Beach Antique Show will be relocating to the Miami-Dade County Fair Expo Center due to the impending closure of the Miami Beach Convention Center for planned renovations. For more information, visit http://www.MiamiBeachAntique.com. The next show on U.S. Antique Shows’ calendar is LUEUR Spring, March 13-15 at the Javits Convention Center in New York City. U.S. Antique Shows, producer of the industry’s most anticipated events, serves the unique needs of the antique and antique jewelry marketplace with shows in Las Vegas, Los Angeles, Miami, Miami Beach and New York. The group’s events offer a broad range of antiques as well as antique, vintage and estate jewelry and watches and annually draws more than 50,000 consumers and 3,000 dealers from 28 countries worldwide. U.S. Antique Shows is a division of Emerald Expositions, a leading operator of large business-to-business trade shows in the United States, producing more than 50 trade shows and over 100 face-to-face events in total, including conferences, summits and other events. The Company connects more than 335,000 sellers and buyers each year and operates within the U.S. in 10 end markets (Gift, Home, General Merchandise and Manufacturing; Sports & Apparel; Design; Jewelry, Luxury & Antiques; E-Commerce; Creative Services; Licensing; Healthcare; Military; and Food). The Company’s shows are typically the most prominent and important for exhibitors and attendees within their various industries. Emerald Expositions is headquartered in San Juan Capistrano, CA. For more information, visit http://www.USAntiqueShows.com, like us on Facebook: Facebook.com/OMBAS, follow us on Twitter: @USAntiqueShows and explore our Pinterest: Pinterest.com/USAntiqueShows. Check out our blog at blog.usantiqueshows.com.